My alternate name for this recipe is “bright and sunny root veg gratin”. Really, how can you not cheer up and forget about the below zero wind chill when you look at this color combo of root veggies. Rutabagas must be yellow for a reason–because in the dead of winter, what’s more uplifting than making the first cut and finding that gorgeous hue? 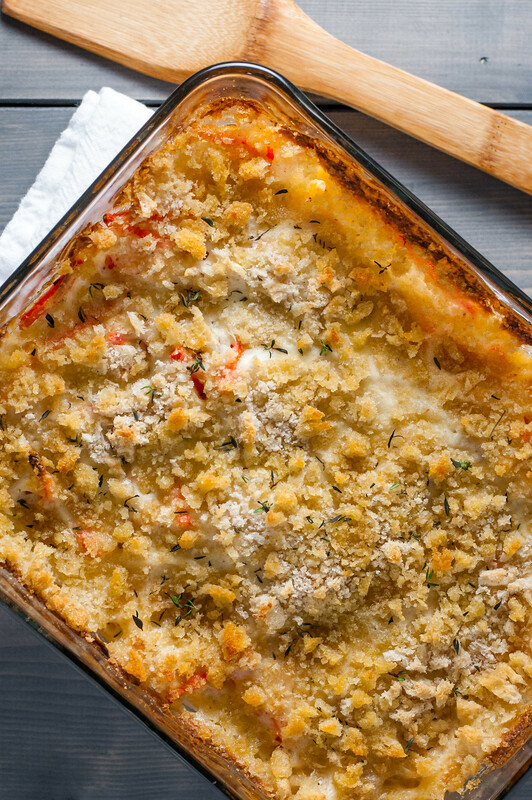 Probably only taking a sweet, crisp bite of it…then transforming the rest into this gratin. If you live in a warm climate or it’s not winter where you are, please comment with stories of beach days and sunshine. I grew up in Minnesota, but the winter we’re having this year in the northeast is, of late, rivaling even the coldest of days in the Twin Cities. On the upside, it’s finally gotten cold enough for that oxymoron of constant sun to take effect. I’m not sure if there’s any scientific backing to this, but rumor has it that the reason for the sunny weather when temps plummet to 10 and 20 degrees below zero is that it’s just too dang cold for clouds to form or hang out. I buy it. Even though going outside is extremely unpleasant, I can, for once, rest relatively assured that I’ll have good photography weather and get to use real live natural light(!) for my photos. Like Friday’s kale puffs. I forgot how easy life (okay, maybe just food photography) is when you’re not combating subtle blue tones and drastic shadows. I’m not a fan of the extra dirty dishes involved in Madison’s double boiler bechamel (white sauce) method in the book. Each of these recipes is already using an average of 3 pots or baking dishes, and I don’t have the world’s largest kitchen, or a dishwashing assistant. Instead of transferring the sauce to cook over very low, indirect heat via double boiler (a bowl set over a pan of simmering water), I keep it in the saucepan, turn the heat as low as it goes, and stir every couple minutes. 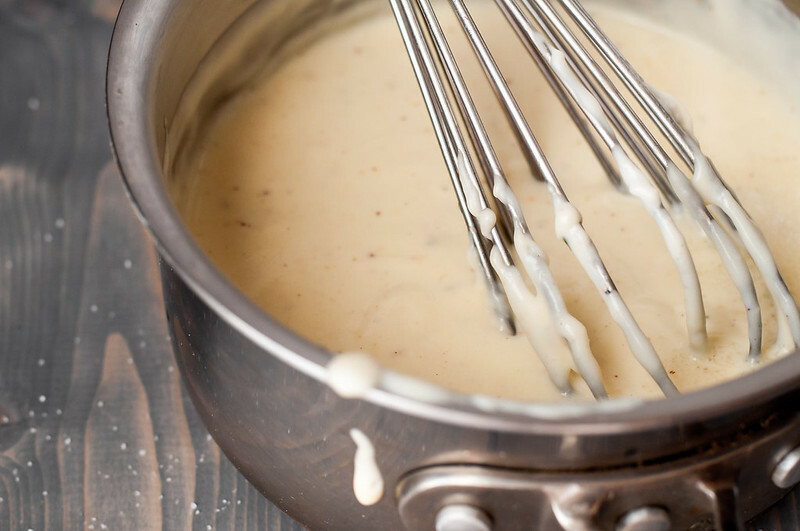 I’ve never taken the trouble to look up the original French method, because I’ve never had a problem with burnt or under- or over-cooked bechamel. If it ain’t broke, don’t fix it. And when you want perfectly executed French food–go to an awesome French restaurant. You may also wonder if straining the bechamel is necessary. Short answer: not entirely. Here, the milk and sauce are cooked beginning to end with aromatics like garlic, carrot, herbs, and peppercorns, which noticeably flavor the end product. But I don’t like thyme leaves and whole garlic cloves in the finished dish, so aside from keeping those out, straining also gives a super silky texture to the sauce. 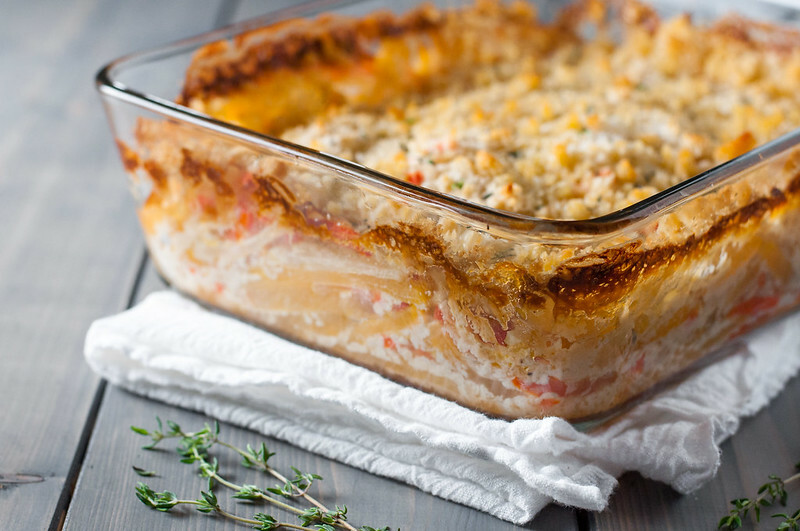 If you like, use edible aromatics (minced and chopped onion, garlic, carrots, and celery) and just skip the slightly messy step of straining the bechamel. If you choose to strain, this is the mesh strainer I currently use, and it’s one of my most used kitchen tools. I’m loving the whole process of a cookbook cook through, and I’m especially looking forward to tackling an upcoming gratin on the road when Steve and I make a visit to my sister and her hubbie’s in OKC (Moore, Oklahoma to be precise) in March. Pioneer Woman country! Updates to come. A bright and cheery combination of turnips, rutabagas, and carrots baked with creamy, buttery white sauce and topped with crispy bread crumbs. Heat a large pot of water over high heat, while you prepare the béchamel. If it boils before the sauce is finished, turn down the heat slightly so it will return quickly to a boil later. Combine onion slices, carrot, celery, thyme, peppercorns, and milk in a small saucepan and heat over medium low. Once warm, gradually raise heat until milk just boils, then remove from heat and set aside, covered. In a medium saucepan, melt 4 tablespoons butter over medium heat, then add flour and stir or whisk constantly for a few minutes as it bubbles slightly. Reduce heat to medium low and carefully whisk while pouring in milk with all its additions. Once combined, raise heat to medium high and bring to a simmer. Stir, simmering, for a couple minutes, until slightly thickened. Reduce heat to low and stir frequently, ensuring that no flour accumulates in the corners of the pan, for about 15 minutes. Set a mesh strainer over the pan used to heat the milk, and pour sauce through it, stirring to encourage all the sauce through the strainer (which may take a few minutes; see notes for alternatives to straining). Stir in cream, then season with ½ to ¾ teaspoon salt, ¼ teaspoon pepper, and a pinch of freshly grated nutmeg. Set aside sauce. Add ½ tablespoon salt to now-boiling water. Lower rutabagas only into water, maintain high heat, and blanch for 2 minutes (water may not return to a boil in that time). Drain rutabaga and rinse briefly with cold water. Preheat oven to 375 degrees (F). Melt 1 tablespoon butter in a medium skillet over medium heat. Add diced onion and cook until softened, but barely browned, about 8 minutes. Place onion in a large bowl and add blanched rutabaga, turnip, carrot, 1 teaspoon salt, and ¼ teaspoon pepper (or more seasoning to taste). Toss to combine. Lightly grease a deep, 8 by 10 inch (or thereabouts) casserole pan or baking dish with butter or oil. Distribute the vegetable mixture in an even layer. Pour béchamel evenly over vegetables, spreading gently with back of a spoon to cover, if needed. Top with a layer of all the bread crumbs, then drizzle with a tablespoon of olive oil. Bake on middle oven rack for 45 minutes, until bubbling and top is slightly golden. Cool 5 to 10 minutes before serving. Leftovers keep well in the refrigerator for a few days. See notes for make ahead instructions. If you don't have the time or tools to strain the béchamel, either use entirely edible, finely chopped aromatics (onion, carrot, celery, garlic) or flavor the milk with a bay leaf and bouquet garni of peppercorns and thyme, removing both just before adding milk to the roux. To substitute ground nutmeg, start with the smallest pinch possible, tasting and adding more if needed. To assemble up to 12 hours (or more?) 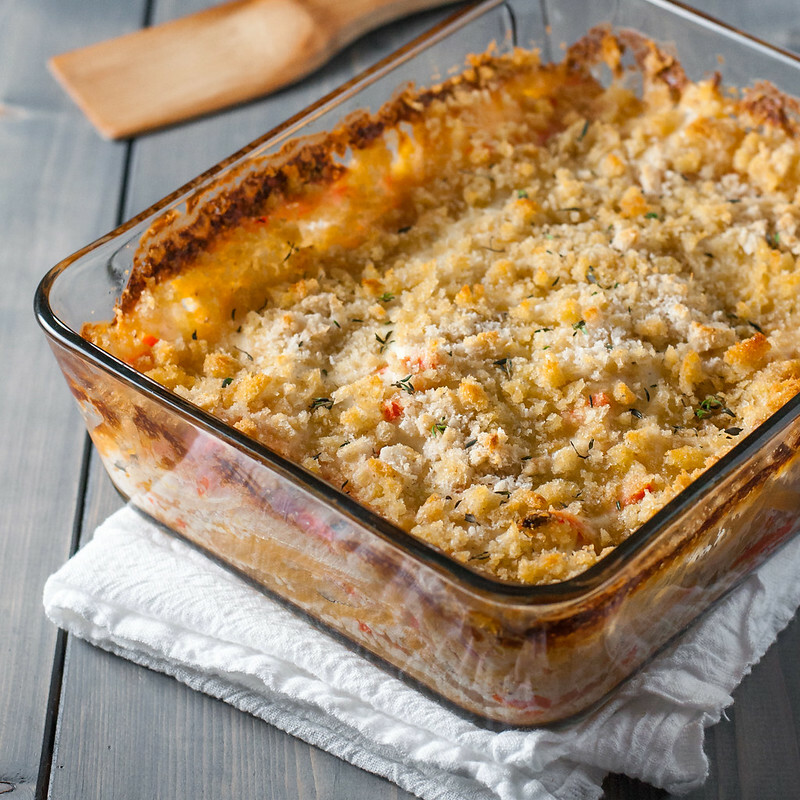 in advance, leave breadcrumbs and oil off until ready to bake and refrigerate in baking dish, covered. Bring to room temperature for an hour before baking, to keep approximately the same cook time. If baking straight from the fridge, add 10 or more minutes, and make sure the gratin is heated through. Note: This page contains affiliate links. It does NOT contain sponsored content. 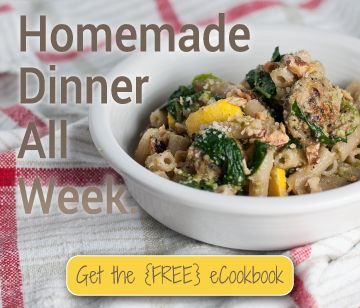 Affiliate links (to products I recommend, on Amazon) offset my ingredient and website maintenance costs, so I can keep bringing you cheerful recipes like this one. Thanks! I love this! 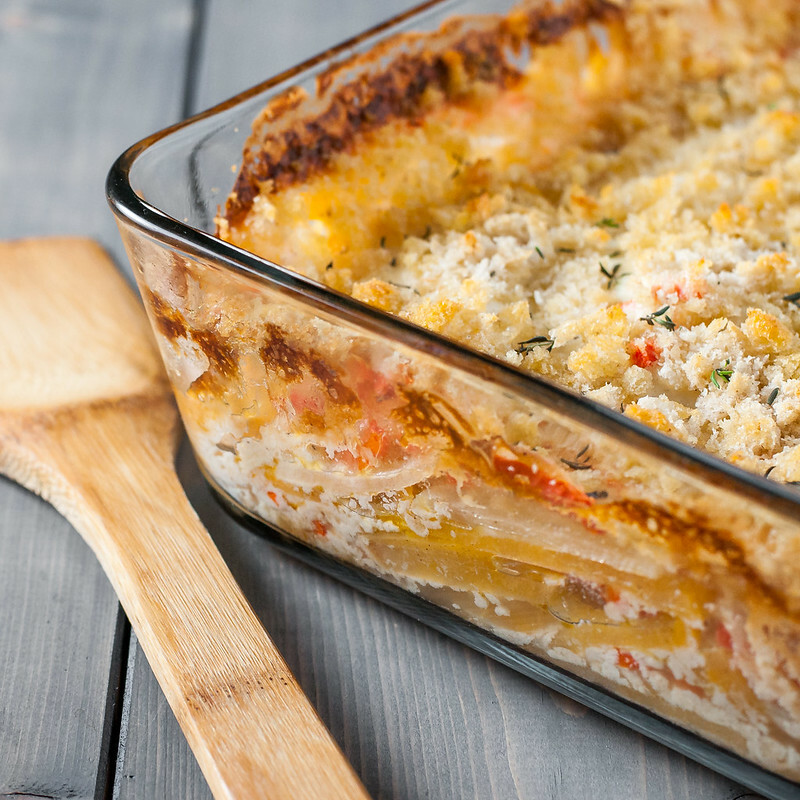 The combination of all those beautiful root veggies in a warm, creamy gratin sounds just heavenly. It wasn’t bad at all :) Thanks! I won’t wait a long time for trying it out, it brings happiness at home! And happiness in the belly! 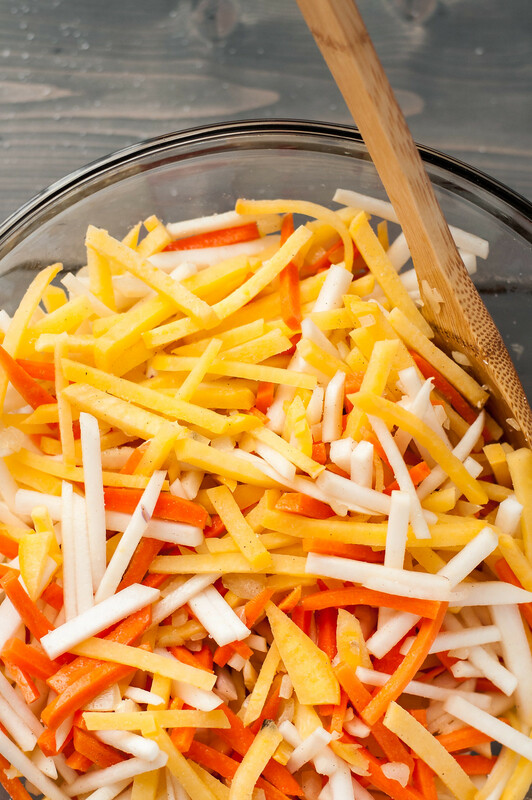 Hey, this is pretty similar to those cheesy carrots I made for you guys when you were little……. I think I remember? It could very well be. New name: Not-that-grown-up cheesy carrots.